Before we start, we are going to tell you that the problem we are going to solve, it won’t be solved perfectly. So, pay attention, and correct us where we can improve. Below is our dataset, which is collected from a 20nm process node. Essentially, it has 4 columns, wire-length, wire-width, temperature and resistance. We are going to predict our resistance just from the wire-length. That will be our linear regression i.e., you have one independent variable – wire-length, and one dependent variable – resistance. We have about 10000 samples, so we are going to divide 80% (8000) into training and 20% (2000) into validation. Validation is a set that is not shown to the training model. So training model will train only on 8000 samples and then you will use your other 2000 to find out, if the model you created is working reasonably well on the validation set or not. If it doesn’t, then it is not good enough. Its not generalizing the model. 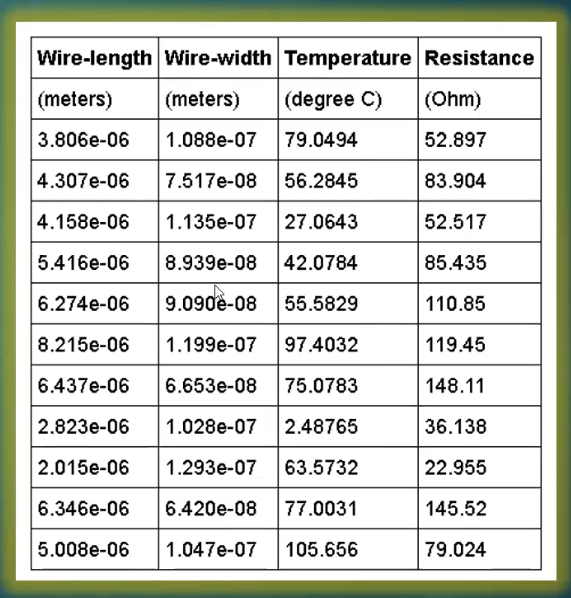 Wire-length, wire-width, temperature will become features, like feature-1, feature-2, feature-3. And the output resistance becomes label. Since you have label and features, this is a supervised class of algorithms. 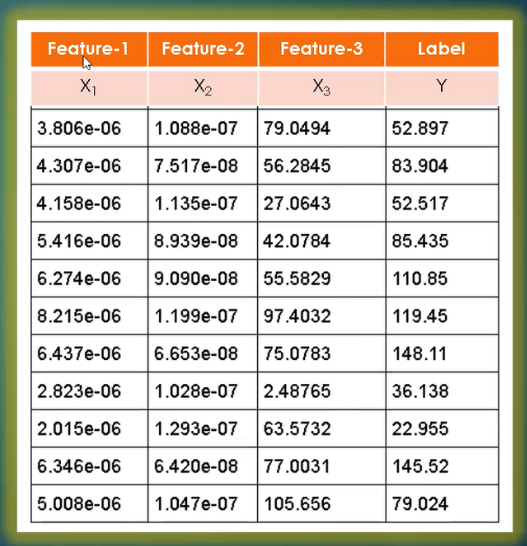 Now, machine learning model is a mathematical function that describes the relationship between these features and labels. Next step is normalization – very important step. Training is prone to fail if you don’t normalize. Normalization is a process of scaling feature values in the same order of variation. Look into all columns of above dataset. The first column is pretty much “e-06” (variation in order 1), second column is varying between “e-07” and “e-08” (variation in order 2), third one is the temperature which is ranging between 2degree to 105degree (variation here is in the order of 2). Now observe the variation between first 3 columns (feature sets) is approximately e+10 [from “e+02” (highest) to “e-08” (lowest)]. And that’s large. When you have such variations, algorithms tend to exhibit unusual behavior. So, you must normalize. What normalization means? Technique to bring the variations of these data-sets to the same degree, like 0 to 1, 1 to 10 or 1 to 100, in a reasonable order so that the algorithm works fine, and you can train it faster. For EDA applications, where you have frequency ranging to GHz and capacitance is 10e-21, the variation is just 10e+30. Square of 10e+30 (regression model) becomes 10e+60, and immediately it goes beyond the range of largest range of number which a machine can hold. Input is wire-length. 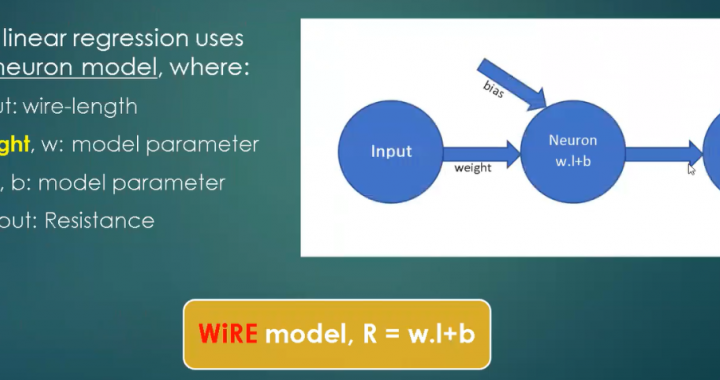 And you have 2 variables which are model parameters, weight and bias, and the center blue circle is your model (Neuron w.l + b). It’s a single neuron. What machine learning will do is, find the value of ‘w’ and ‘b’ for you, given the data-set (‘length’). This will look at all 8000 of your samples and it will find ‘w’ and ‘b’ such that, your model is a best fit for all 8000 parameters. Posted in Conference, Design, Machine Learning, Open Source.